The Illustrated Corvette Series by K. Scott Teeters ISBN: 978-1-934709-46-7 144pages, 392 illustratons. While it is well-written, for me, this book was more to look at than to read because I've always liked K. Scott Teeters' art work. Teeters is an illustrator and writer who has contributed to Vette Magazine since the late-1970s. In 1998, he began doing a monthly column for the magazine where the entire page to a specific Corvette. He illustrated each column with his own line art. A fixture in Vette magazine since then, Scott Teeters' Illustrated Corvette Series has entertained and educated readers for over a dozen years. His one page articles, illustrated with his detailed line art, have given fans of America's Sports Car a unique perspective on the Corvette experience. CarTech Books has done a great favor for the Corvette hobby in bringing together 161 of Teeters' columns into a single volume. 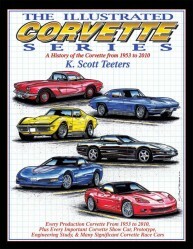 The entire history of the car is represented on the pages of The Illustrated Corvette Series in artful style. Teeters delivers well-researched facts and figures on all of the production Corvettes to the 2010 model year along with racing Vettes, special editions, concept cars, and tuner variants crafted over the years. Additionally, the author offers his passionate review of a potential new Corvette design. Anyone who likes Vettes will appreciate The Illustrated Corvette Series. The thoughtful opinions and facts presented, teamed with the incredibly detailed artwork, makes this book a truly unique offering.